Major Contract Wins Keep ESK Revenues on Track to Jump Again? If you’ve been paying attention to geopolitics and the dramas playing out on the world stage lately, you’ll know that security and emergency management and communication has never been more important. Whether it’s the threat of natural disasters, terrorist attacks, newer and more complicated forms of crime or just the general accidents that come from modern living, it can be bumpy terrain out there in the big wide world. Secure and reliable communication tools are thus vital for governments and corporations. These tools are being developed using advanced technologies to form a foundation of robust and secure solutions for all imaginable scenarios. Beyond the ‘mission critical’ emergency services communication and law enforcement are the equally critical communication needs of utilities and resource companies. 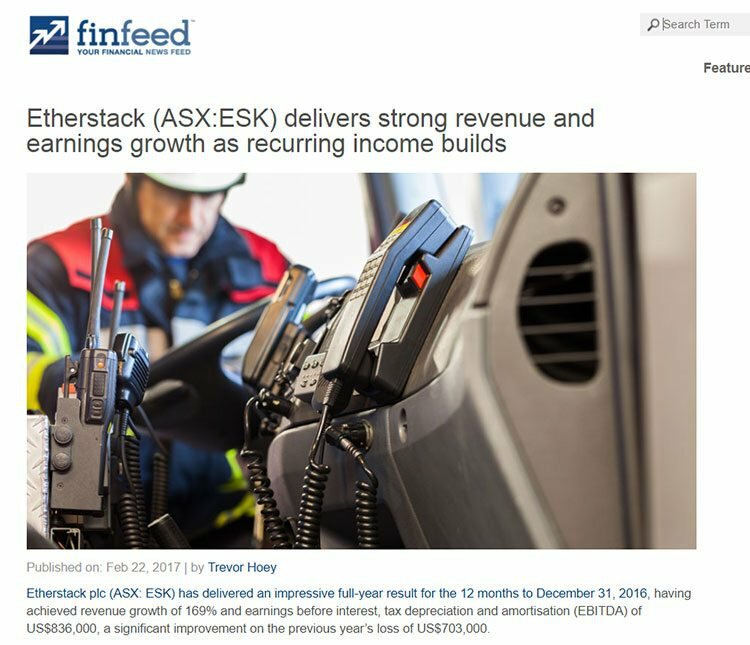 Taking centre stage in this arena is Etherstack (ASX:ESK), an ASX-listed small-cap which supplies public safety standard communications equipment and technology for system integrators and network operators, including police, fire, ambulance, utilities and mining sector companies globally. While such reliable means of communication are highly sophisticated and complicated to develop, ESK has done the hard work and R&D to arrive at a point where it can supply its best-in-class tech. It’s been on this track for a while, having amassed some major contract wins, both domestically and overseas over the last decade. Now, before we go too far, we should note that this is an early stage stock and those considering an investment should seek independent financial advice. In February, the company reported impressive full year 2016 results, yet it seems that the most remarkable growth is still to come. In June, the company said it expects full year revenue of US$6.4 million (A$8.4M) to US$6.9 million (A$9.1M) in 2017. ESK has also flagged further revenue growth into 2018, including the product launch of ‘IVX’ in the third quarter of 2017 and acceleration of market interest and sales for its SFFR-6 Tactical Repeater product. It forecasts the revenue figure will jump to US$7.3 million (A$9.6M) – US$7.8 million (A$10.3M) for the 2018 financial year. Add to that the fact the company is holding a higher-margin product mix than it did in 2016 — all with the same overheads and operating costs. 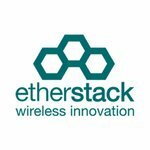 Sydney-based Etherstack (ASX: ESK) supplies public safety standard wireless communications technologies for system integrators and network operators, with a user base consisting of police, fire, ambulance, utilities, mining and transportation sectors globally. 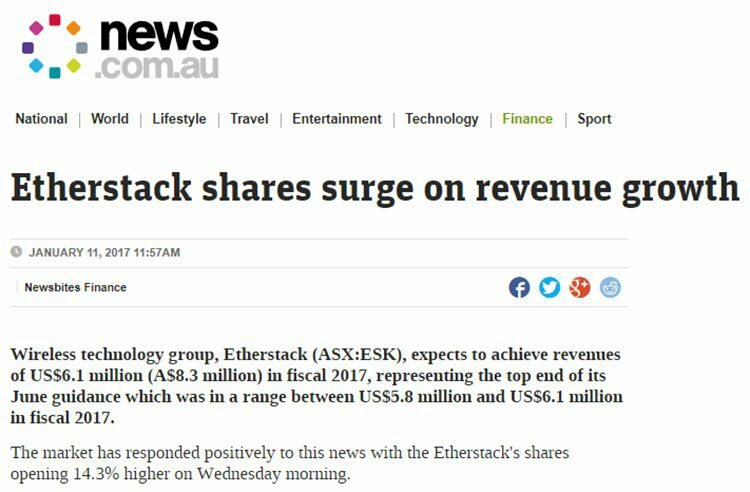 We last covered the company in March in the article: ESK Sees 169% Jump in Revenues as its Radio Tech Brings it Back in the Black . A few months later and it looks as though revenues are still climbing. The revenue projections mentioned earlier for the coming two years — FY2017: US$6.4M-$6.9M and FY2018: US$7.3M-$7.8M — come after impressive full year results for the year to December 31, 2016. The details of this result — including its 169% year-on-year revenue rise — is explained in the finfeed.com article below. In summary, ESK saw a significant improvement in earnings over the prior year, highlighting the ability of the company to deliver valued technologies to customers. These results and the guidance for 2017 and 2018 is particularly impressive given that the company has a market cap of just A$16.75M. Much of this growth came on the back of ESK being awarded several multi-million dollar projects in North America, mostly related to large corporates and utilities, which deliver ESK with defensive earnings streams. ESK also broadened its customer base locally, when it received its first order from the Australian Department of Defence. The company is predicting a higher margin product mix for the year. The company also predicts it will increase its positive cash flow in 2017 and beyond. It should be noted, however, that any performance projections are speculative at this stage and should not be taken as guaranteed. Investors should seek professional financial advice for further information. The guidance also noted that overheads and R&D costs will stay at 2016 levels throughout 2017 and 2018 while the non-cash amortisation charge will decrease significantly in 2018. A number of multi-million dollar projects awarded across North America, particularly in utility sectors, should provide strong support revenue growth for 2017 and onwards. 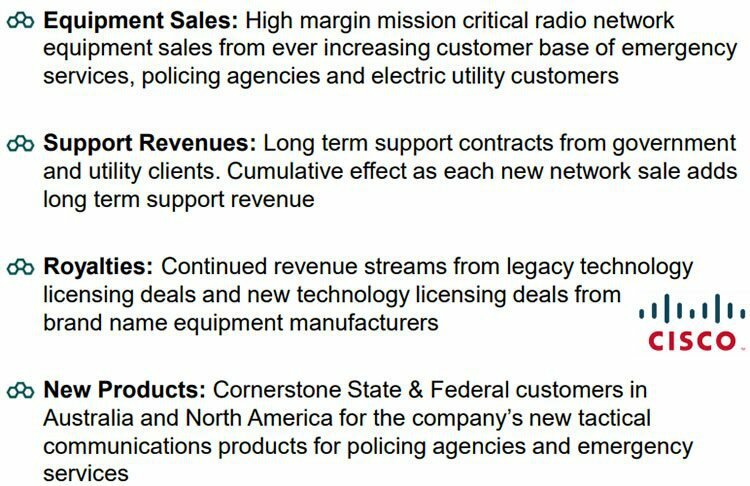 A major increase in recurring revenues will be driven by long term radio network support contracts (typically 10+ years). ESK has an expanding licensee client base, including its first technology licensing sale to NEC Japan occurring in the past 12 months. The government customer base in the US and Australia is also broadening, as evidenced by the recent Australian Department of Defence contract. The repeater product has done very well so far, with repeat repeater orders from lead government customers in the last two years. With North American certifications now underway, and expected to be completed in August 2017, the addressable market for the SFFR-6 could expand 20-fold . This includes US Federal government pilot customers, which are expected to translate into fully paying customers that will materially boost sales well into 2018. The demand for these products is yet to be determined, so investors should seek professional financial advice if considering this stock for their portfolio. The second product predicted to crown ESK as the leading provider of specialised radio communications products is the launch of its IVX product, scheduled for the third quarter of 2017. 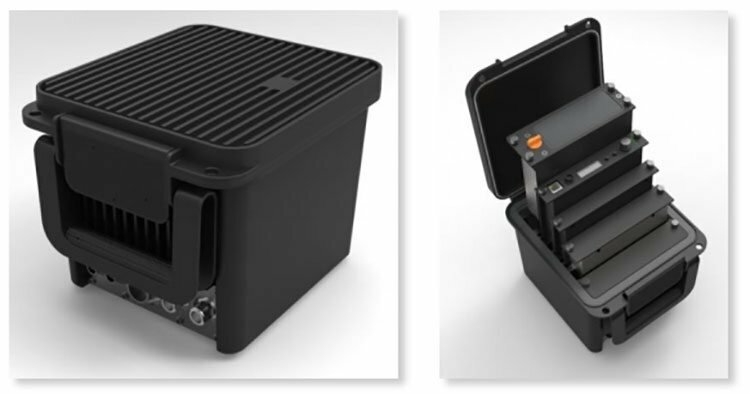 On the verge of release, the SatCom/3G/4G communications device is currently under field trials with US and Australian government customers. There’s been plenty of strong interest in the new product from both state and federal agencies — meaning there’s potential for more major contracts to further bolster the balance sheet in the near-term. It’s not hard to picture immense growth for ESK, even beyond its revenue guidance, as it keeps stacking its wins on the board, including impressive contract deal flow. Its conquests have all led up to this key period, where growth exceeds that of competitors... and the whole value proposition begins to look like a runaway train of revenue. Going forward, ESK is undertaking further product development for the defence industry as well as reimagining the form factor and functionality of highly specialised communications devices. The company has plans to keep a high growth focus by selling its new tactical communications product line, including the recently released tactical repeater to State and Federal Government customers. It also aims to better meet customer demand via improved attention to detail, including combining proven technology performance with high quality customer support. This carries over to repeat network equipment sales and recurring revenue growth via support contracts and royalties. ESK’s continued focus on research and development allows it to remain at the forefront of mission critical radio communications technology. Whether the investor market catches up with ESK’s exceptional momentum now or later, remains to be seen. Have you heard about Raisebook? Joining Raisebook will give you free access to opportunities not normally available to general retail investors – however you must qualify as a sophisticated investor under Section 708 of the Corporations Act. These opportunities are as diverse as stock placements, seed capital raisings, IPOs, options underwritings. Plus a whole host of other high risk, high reward investment opportunities not available to the general public (careful – this stuff is high risk!). Please note: Raisebook is a related entity of S3 Consortium Pty Ltd as defined in Section 9 of the Corporations Act 2001. The Little Known ASX Stock Signing Multi-Million Dollar Contracts: Breakout Year? Interested in more investment opportunities?